The dualwatch operation and dual spectrum scopes with the waterfall functions* can be used on your remote PC. MAIN and SUB spectrum scopes can be observed on the RS-BA1 at the same time. Of course, the RS-BA1 can be used with Icom single receiver transceivers. * The dualwatch and dual spectrum scope functions are only for the IC-7851, IC-7850 and IC-7610. 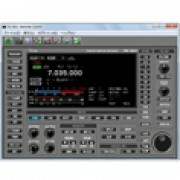 The spectrum scope functions (single receive) are usable with the IC-7300. Most functions and modes of your transceiver, including interference rejection functions and IF filter settings, can be controlled using the CI-V commands. The following functions are added to the RS-BA1 Version 2. The RS-BA1 offers real-time operation with low latency, high quality audio. You can use the transceiver installed in another room using your home network, or even from a remote location over the Internet*. * A static public IP address or Dynamic DNS is required for the base station (Server) PC, when you configure the remote control system through the Internet. ✓ : Function available. - : Function Not available. Please use the latest firmware version of the transceiver. Note for original version RS-BA1 users: Free upgrade service from RS-BA1 to RS-BA1 Version 2 is not available. To obtain the new features in the RS-BA1 Version 2, the purchase of a new software package is required.